Clearly I need more time to gather my thoughts on The Lords of Discipline (whatever, there’s a reason it’s called #onthecouch), so I thought I would take a time out and tell you about a different book instead. I know, I know, you shouldn’t judge a book by its cover. But you should totally judge this book by its cover! Oh, there it is. I have to change the title of the post. The original title was Embrace the Crazy. Maybe if I start by telling you a little about the book, that will make some sense. Actually, let me start a little further back because, you know, that’s what I do. I like to give a little backstory. A little context, if you will. So tra la la, life was grand and Kiersten was working on a new book with a new character who was very different from Evie but felt familiar in that oh yes, Kiersten totally wrote this book kind of way, and Agent Michelle was happy. That’s Agent Michelle being happy. And perhaps a bit clueless. No, that’s literally what the email said. I swear. And it had MIND GAMES attached. I mean, good thing she was already my client. Can you imagine if I got an unsolicited email like that? With an attachment??? Actually, I think I did once. Anyway, I digress. I opened it, started reading, and I’m pretty sure I didn’t stop until the very last page. I literally could not put down the awesome, twisted, angry, but unbelievable MIND GAMES by Kiersten White. Oh, and Fia! You total crazycakes. You are so scary but I love you so much. 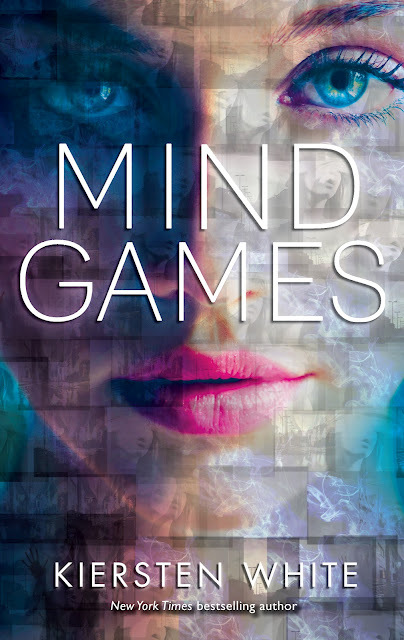 These three days of Kiersten’s blog tease for MIND GAMES have been so fabulous to watch because each part so perfectly captures this book. I absolutely love Laini Taylor’s blurb. I love the back cover. And I LOVE LOVE LOVE the cover. How incredible is this cover??? I think we have to give major props to HarperTeen designers Alison Donalty and Michelle Taormina for coming up with the most perfect cover for this incredibly complex, yet mind blowingly awesome book. Wait, did I mention that I love this book?? And you’re going to also. As soon as it comes out! On February 19, 2013–yay!! Oh boo hoo. It’s really not that far away and I have SO many awesome books coming out between now and then you won’t believe how time is going to fly. But first, judge this book by its cover!! In the comments. It’s so awesome, right? Right?? Then go tell Kiersten what you think! Oh, and read the new bio on the full cover. It’s also scary. I mean scary awesome. I absolutely love it! And I’ve heard so many amazing things about this book already from Natalie and a bunch of other people and now this cover and the blurb by Laini and wow. I just CAN’T WAIT! LOVE IT!!!!! Bring on the Wolf Pack ARC Tour!!!!! Perfectly gorgeous. Very excited to get it in my own little hands. It’s wicked awesome! 😉 I can’t wait!!!! True story: I discovered you, Michelle, by picking up Paranormalcy at my kid’s school book fair, because I LOVE the cover…and then of course I fell madly in love with Kiersten, which ultimately led to you because I just had to know who was the awesome agent who picked such a delightful, funny and talented writer and her deliciously fun story out of the slush pile! 🙂 WELL DONE!!!!!!! Well done ALL!! Congrats to Kiersten and I anxiously await it, also seething green with envy that you already got to read! Love the cover and I cannot wait for the book to come out! Your work is amazing and I anxiously await the time when you open up for submissions again. Until then, I will continue to patiently wait and polish my query for you! Congrats. How incredible? So incredible!!! Why oh why isn’t it February 2013 yet?! I got so, so, so excited and then the GAAAAAAH I HAVE TO WAIT A YEAR FOR THIS moment came. Still, I’m so excited about this! Kiersten is amazing!